Duel Threat – Carlos Hyde and Jordan Hall with 100 yards. Want to see Hyde get in there with the 1st O line and run over people. Sorry Hyde and Hall….this was Elliott’s day! Less Penalties – Penalties are killing this team and 75% of them are of the stupid variety. Much better here….only three! A special teams TD – No TD scored but they definitely setup TD’S! Mix It Up – A good mixture of Wilson and Elliot late in the game. – Elliott definitely got his share with 162 yards. Tackling - I still believe that one day this hope will come true. – Improved! Did We Mention One Half? – No more than one half for Braxton and at least one quarter for Cardale – this is going to be a blowout so get Braxton out there long enough to shake off some rust and then get him back on the sideline, personally I’d prefer him only in for a quarter. Give Kenny one quarter or so and then bring on Cardale and the 3rd team. 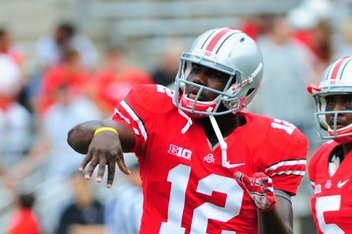 – Braxton missed out but Cardale got to show some of what he has! Touchdown? – A defense or special teams score- Not quite…. No stupid penalties – Most penalties are stupid but we cut down on them. Focus – Consistent focus from the team, no looking ahead to next week – In a 76-0 game this team kept it’s focus. Leave Bosa Alone – Kid is going to be an AA defensive end. Turn him loose and find somewhere for Washington. – Consider him uncaged! Duel Threat – Carlos Hyde and Jordan Hall w 100 yards. Want to see Hyde get in there w the 1 O line and run over people. Less Penalties – Penalties are killing this team and 75% of them are of the stupid variety. One Half - Braxton to play a half, just to knock the rust off. Mix It Up - A good mixture of Wilson and Elliot late in the game. Tackling - I still believe that one day this hope will come true. Did We Mention One Half? – No more than one half for Braxton and at least one quarter for Cardale – this is going to be a blowout so get Braxton out there long enough to shake off some rust and then get him back on the sideline, personally I’d prefer him only in for a quarter. Give Kenny one quarter or so and then bring on Cardale and the 3rd team. Leave Bosa Alone – Kid is going to be an AA defensive end. Turn him loose and find somewhere for Washington. The Buckeyes return home from a successful Left Coast trip to play an FCS opponent out of the Mid-Eastern Athletic Conference (MEAC), the Rattlers of Florida A&M University (FAMU). The Buckeyes (3-0) are coming off an exciting, yet convincing, win over Cali-Berkeley (52-34), while the Rattlers (1-2) lost to Samford (27-20). This is OSU’s last game before Conference play begins, so it will be a good opportunity to take care of a few loose ends. False starts and tackling techniques come to mind. Even though, to Jason’s chagrin, this is a noon start, the weather forecast is for low 70’s, cloudy and 30% chance of rain. This is no time to “go Cal” and not show up until well into the game. We’re fortunate to have a really good football team; be there to support them. This will be a good game to get a couple quarterbacks some playing time before conference play; Braxton Miller and Cardale Jones. I think that Ken Guiton has proved his capability and reliability. Braxton probably needs some fine tuning after missing the last two games, and Cardale needs some ‘live fire’ experience, just in case. FAMU’s defense is giving up 321 yards per game, good for 70th in the country if they were FBS. I think that pending too much experimentation on Urban’s part, OSU will find this defense a bit less challenging than last week. The bright spot for FAMU is that against Samford, they did come up with 2 pick-6’s. After an exciting week in Berkeley, the Bucks return home in a final warmup before B1G season. As the Rattlers come to town, there’s only one choice for the soundtrack this week. Injury Update- The plan is for Braxton to play some on Saturday; reports from practice had him wearing a brace but with no noticeable limp. That’s the good news. The “not yet” news is that Adolphus Washington will miss the FAMU visit to Columbus, as the Buckeyes try to ensure that he’ll be healthy for B1G play. Coach Meyer said several times this week that he would be “probable” for Wisconsin. Good Problem To Have- Meyer seemed most optimistic about the play of the defensive line, and praised Coach Vrable’s work with the “young pups”. Given the pressure that they’ve been able to apply minus Adolphus and Tommy Schutt, you’ve got to think that something is going right in the trenches for the Scarlet and Gray. And Then- There’s the linebackers, who still have some question marks in place for Ohio State. Meyer emphasized again that the depth is not what it needs to be given some of the “misses” in recruiting in the last four years; fans will remember that several key stars either haven’t panned out as of yet or have left the program altogether. At this point, the ‘Backers haven’t been tested, but with conference play coming up that’s sure to change. Seeking Hyde- Carlos is back after his three game suspension, but won’t immediately fall into the starting lineup on Saturday. Not only is the current lineup firing on all cylinders, it will take a bit to find a “fit” for Carlos’ game within the offense. In addition, it wouldn’t be fair, according to the coaches, to sit Jordan Hall given the work results that have been produced over the past three weeks. For The Sake Of Argument- Gene Smith helped schedule this week’s FAMU game in part to bring their amazing band to The Shoe. However, as an FCS school (and not a great one, at that), the game certainly won’t help Ohio State’s “strength of schedule” perception. On the off chance that three or more schools finish undefeated (Alabama, Clemson, Oregon, tOSU), this game might cost the Buckeyes a chance at the Crystal Trophy… Or, as a friend of mine put it, “Gene Smith will have cost the Buckeyes two consecutive chances to play for a national championship”. Discuss. Smooth- The same goes for Kenny Guiton, who will certainly have a large number of opportunities behind center moving forward. Again, he’s certainly earned the right to do so. Remember When- Ohio State fans used to envy schools like Southern Cal for their full stable of tailbacks and five star QBs? Pretty nice living, ain’t it? Young’uns- There’s a lot of anticipation that some of the newer faces for Ohio State will see action this week; Corey (Pittsburgh) Brown spoke at length regarding Eli Apple, Cam Burroughs, and Vonn Bell’s work in practice. Here’s hoping they get to showcase on Saturday. Jazz Brings The Swoons- Or is it that folks Swoon for Jazz? Either way… this photo does both. Bitter Bear Face- If you hadn’t already, you should read this article about how Cal’s football program has higher ideals in mind than Ohio State. Then, you should remember that Cal’s APR from 2012 would put them dead last in the Big Ten… 16 points behind the team at the bottom (hint: The Harvard Of The West). New Threads- Sounds as if this year’s Nike uniforms for The Game will be a white version of the ones we saw in last year’s win. Smooth Moves- Braxton Miller’s sprained MCL proved to be bothersome enough for Saturday’s matchup against Cal that Urban Meyer gave Kenny Guiton the nod to start at QB. 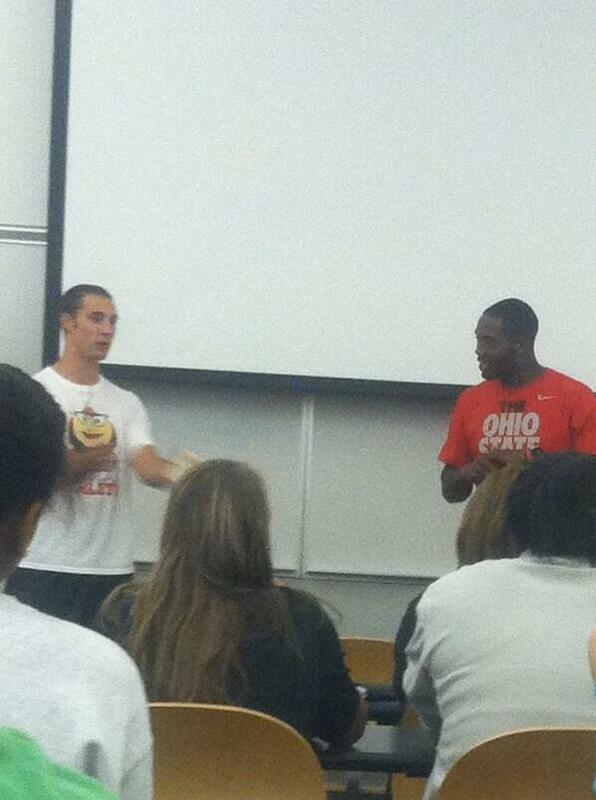 Someone tell Kenny Guiton that he is the back up, because he’s certainly playing like QB1. He knows the offense inside and out, reads defenses like a book, distributes the ball with mathematical precision, is a captain and carried his team to victory for the second week in a row. Named the Walter Camp player of the week, Guiton went 21 for 32 passing, threw 4 touchdown passes including a 90 yard soul crushing bomb to Devin Smith, and rushed for a whopping 92 yards. Not So Fast My Friend- OK Guiton was magical, wizard status magical but Braxton Miller is the starting quarterback for the Ohio State Football Buckeyes for a reason…several reasons. As you’re reading this, I’m prepping for the drive from Los Angeles to the Bay Area with the Mrs. for Saturday’s game. Given that we got engaged on the Marin Headlands, this song by one of her favorite performers is the obvious choice for this week’s soundtrack. Gonna’ warn you, though… this week’s reflection is… uh… verbose. Injury Update- The question that everyone’s been asking hasn’t yet been answered, as Coach Meyer said that Braxton threw a bit on Wednesday before leaving practice to get more treatment on his knee. Coach commented that the issue isn’t pain, but seems to be “stability”, and that Braxton is adjusting to his knee brace. It would not be surprising to see Kenny G start and be relieved by Miller, nor would it be a shock to have them split time at the position. Both will travel, Coach Meyer indicated that they would know more after Thursday’s practice and that he remained optimistic. Two Thoughts- 1) The last time Braxton was held out of play in a game he returned to action and performed pretty well. 2) That being said, if Ohio State feels that they can win the game with Smooth Jazz and give Braxton a week (or two) to recover, I wholeheartedly support that decision. Long term goals here, peeps. Also- Adolphus Washington did not practice on Wednesday, but is expected to travel. His is a bit of a different situation, as the injury is something that can linger. Also, as amazing as Washington is on the field, the Young Bucks are doing good work under Coach Vrable’s direction. Red, Not Scarlet- A couple of older “back ups” that many are surprised have not gotten the playing time they were expected to were discussed on Wednesday, and Coach Meyer said that it’s a possibility that Bri’onte Dunn and Michael Thomas may end up redshirting if they aren’t going to be a part of the planning this season. He also discussed how he felt that they were “wasted” by the coaches last year, and didn’t want to make the same mistake moving forward. Getting Defensive- Ryan Shazier talked about the Silver Bullets’ excitement to play Cal, and that they were working diligently to ensure that the Bears didn’t have the success necessary to string together drives and run 100 plays a game. He also spoke about the need to maintain leverage on Cal’s running back Brendan Bigelow, as his ability to get to the edge is a strength that created issues for Oho State last year. However, Shazier mentioned that Bigelow’s talents were helped by a number of small mistakes that the young defense made last season. Getting Ready- Playing the role of Bigelow this week in practice? Carlos “I’ll be back next week” Hyde. Not too shabby. Stripes Lost- I guess we’re still doing that now, as Cameron Johnston, Tyquan Lewis, and Trey Johnson all had their black stripes removed today. Woot! Tags: 2013 Season, Adolphus Washington, Alabama, Amateurism, Braxton Miller, Brionte Dunn, Cameron Johnston, Carlos Hyde, Charles Robinson, George Dorhmann, Kenny Guiton, Les Miles, Michael Thomas, Mississippi State, Oklahoma State, Ryan Shazier, Sammy Silverman, SBP, Sports Illustrated, Tennessee, Trey Johnson, Tyquan Lewis, Urban Meyer, Yahoo! Tough day for quarterbacks. Especially this one.. In today’s edition, we celebrate number 5, the Ohio State’s margin of victory over Michigan on November 24th, 2012, 26-21. The Game is always a meaningful game, but especially so in 2012. Due to some unfortunate circumstance the prior year, the new coaching regime would not be eligible to participate in post-season games. Although Michigan scored twice on big plays (Roundtree 71 yard reception, Robinson 63 yard run) their four turnovers either contributed to short-field Ohio State points or killed UM drives. Trailing 20-21 at the half, the Buckeyes played much. much better in the second half and shut out the Wolverines.Michigan’s 2nd half drives consisted of loss of downs, two punts and three turnovers. Not a whole lot of production right there. Meanwhile, Ohio State did manage two 2nd half field goals; not much scoring, but just enough for another win. However, both Carlos Hyde (146 yards) and Braxton Miller (108 yards) had good rushing days, and Miller was a very efficient 14-18-189 yds passing. In today’s edition, we celebrate number 12, the Ohio State’s margin of victory over Penn State on October 27th, 2012, 35-23. The Buckeyes rolled into Beaver Stadium for another White-Out Game. As expected, it turned into another Pick-Six Game as Ryan Shazier coupled a 17 yard interception return the play after a nine yard sack. Thank you, Ryan. The game was tied 7-7 at the half, then Ohio State proceeded to pull away in the 3rd quater, outscoring PSU 21-3, based on Shazier’s pick-6 and two, 1-yard Braxton Miller TD runs, one of which he displayed video game-like moves. I’m not kidding. Thanks to Kade at MotSG.